Thanks to consultant nurse Cliff Evans and a team of senior staff, patients at a Medway NHS Foundation Trust emergency department, Kent, are no longer being treated in corridors. Medway NHS Foundation Trust, Kent, has spent more time in special measures over the past four years than any other trust. In 2013, a mortality rate of 26% above the national average prompted a Care Quality Commission (CQC) inspection. Substantial safety issues were discovered in Medway Maritime Hospital’s overstretched emergency department (ED), where about 1,000 patients a month were cared for in corridors, resulting in significant episodes of harm. In March 2017, however, the CQC’s chief inspector of hospitals recommended the trust come out of special measures because of the ‘significant improvements’ it had made. Central to the presentation given to CQC inspectors was work to transform patient safety in the ED. The driving force behind this work is consultant nurse Cliff Evans, who in September 2015 was seconded to Medway for one day a week by NHS England under the ‘mutual aid’ scheme before taking up post permanently. His initiatives have resulted in reductions in episodes of patient harm and vacancy rates, while development programmes have improved clinical skills and morale among senior and junior nurses. No patients are cared for in corridors any more. Mr Evans had been working at neighbouring Maidstone and Tunbridge Wells NHS Trust, having been brought in when it was in special measures. ‘They shared a similar situation,’ says Mr Evans. ‘Insufficient workforce, poor processes and systems, and an element that the majority of nurses – the most experienced – did not have the skills and knowledge base you would expect them to have at that point of their careers. At Medway, with the senior team in the ED, Mr Evans put together a comprehensive three-month strategy focusing on patient safety, workforce development and education, and sustained improvement. As well as a 65% nurse vacancy rate, only four nurses had emergency care qualifications relevant to their posts. Audit is central to Mr Evans’s approach, to the extent that his staff think he is ‘obsessed with it’. But audit quickly identified the prime causes of poor outcomes: keeping patients in corridors and patients having no effective initial assessments. He spent one of his first days undertaking an observational study of 24 patients cared for by one nurse and a support worker in the corridors. The trust board knew corridors were being used in this way and that it was bad for public relations, but thought the patients were at low risk. However, Mr Evans’s study showed that 70% of the patients were emergency cases, including some with stroke, heart attack and sepsis. His response was to develop a bespoke initial-assessment tool based on early warning scores (see box 1). Mr Evans’s next step was to devise an education and development programme to improve clinical skills and help recruitment and retention (see box 2). ‘All nurses want to do is to provide great care,’ says Mr Evans. ‘It’s what they came into nursing to do and there is no better carrot than training to help them do it. Training helped embed improvement, says general manager of the emergency programme John Ferguson. ‘The challenge in any organisation in difficulties is change and one of the first casualties in such organisations is education. Nurses at all levels testify to the significantly better care and working environment. Senior sister Charlene Gibb, for example, says patients are ‘a lot safer’. There is also growing interest in working at the Medway ED, she says, and more nurses want further training. Senior sister Emma Parkinson adds: ‘The development programme will improve retention because staff appreciate the investment in their education. Charge nurses from other areas are applying for ED roles and morale among staff already there has improved. Charlotte Weymouth-Hollywell agrees: ‘I felt stressed and undervalued working in the corridor, but we worked hard as a team to do the best for patients. There was not much training on offer. ‘The triage system is now more robust. We have a good team, who are always happy to offer advice if in doubt. There have been challenges, however. Medway faced heavy criticism and intense scrutiny. Mr Evans recalls: ‘As a senior nurse, there is nothing worse than when you feel unsafe. In the first few months you don’t know what you will come in to. You could be on the tabloid front pages. The past is not forgotten, however. In teaching, older assessments are presented to highlight differences in care. ‘These were good staff working in a horrible environment,’ says Mr Evans. ‘One of the vital factors over the first year was revisiting the past in a non-blame way. But the future looks bright. The trust is celebrating better friends-and-family test ratings while mortality rates are now below the national average. So why did his plan work when others have failed? Clinical lead consultant Ashike Choudhary says: ‘As a department, we were ready and waiting to change. Cliff came along with knowledge and experience – he had done it at four trusts – of what we could do. ‘In the middle of the worst time, when we were in dire straits, it was quite hard to see where the problem was. ‘We would not know where the sick patients were; we had to use a sixth sense to find them. It was a stressful and difficult environment to work in, but you’d get to the point where you think it’s normal. ‘We had tried to change ED processes several times and had got to the point where we did not know what we were trying to do. We were chasing impossible targets that did not make any sense. He also credits the excellent nurses at Medway, including senior nurses he brought with him from his previous post: ED matron Kathy Ward, and senior matron for acute and continuing care Clare Hughes. Mr Ferguson, however, says that Mr Evans has been the driving force behind the educational and operational strategy. ‘This was coupled with a further strategy for consistent and sustained improvement. His support for colleagues has created a strong, dynamic team that focuses on each patient as the centre for all improvement and development. 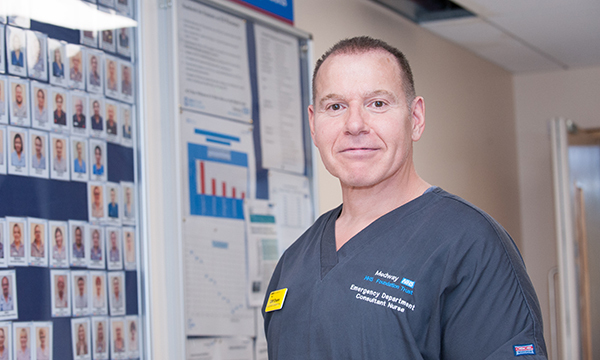 Consultant nurse Cliff Evans, supported by the senior emergency department (ED) team, developed a bespoke initial-assessment tool based on national early warning scores (NEWS) because a retrospective audit of patients’ notes had shown patients were not escalated appropriately. Previously, patients were seen in line with a ticketing system rather than being assessed and prioritised. Every member of staff completed a two-day course before the tool went live. In just six months, there was a 50% reduction in mortality, a 70% reduction in harm to patients and the number of incidents resulting in long-term harm was halved. Education and staff development are core elements of Mr Evans’s strategy. Job descriptions were re-written – and watered down in an attempt to fill positions – but, with a 65% vacancy rate, it was essential to keep staff in post and address senior nurses’ lack of specialist qualifications. A former university lecturer, Mr Evans wrote a University of Greenwich-accredited degree and master’s emergency nursing course for all senior and junior sisters. Mr Evans persuaded local universities that had banned students from undertaking placements to let them return. ‘Without students, how do you build your workforce of the future?’ he says. A series of workshops on emergency nursing careers attracted 16 job applications, and the recruitment plan includes the provision of a support package and 18 months of preceptorship for newly registered nurses, as well as a good working environment. Staff nurses already in post have also started a development programme so they have the same opportunities available to nurses under preceptorship, but in a less structured way. Mental illness … or disability?